Magnetic field lines whip chaotically near a newborn star in this artist's illustration. Astronomers have mapped the tangled web woven by the magnetic field of a gas cloud as it births a star. The Earth's solar system might have looked the same in its earliest days, the researchers said. Researchers using the Atacama Large Millimeter/submillimeter Array (ALMA), an enormous radio telescope array in Chile, discovered a weak and tangled magnetic field around a protostar, called Ser-emb 8, about 1,400 light-years away in the constellation Serpens. A protostar is a star at the very beginning of its life, when the gases have just coalesced enough to start thermonuclear fusion. Protostars are still amassing material from the gas clouds they form from. Until now, the consensus was that protostars' magnetic fields were strong, relatively orderly, affairs, the researchers said, taking on a classic hourglass shape and not becoming disrupted until one got several light-years away. 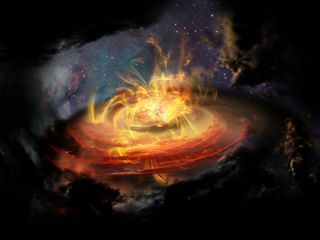 "Before now, we didn't know if all stars formed in regions that were controlled by strong magnetic fields," said Charles L. H. "Chat" Hull, an astronomer and NRAO Jansky Fellow at the Harvard-Smithsonian Center for Astrophysics in Cambridge, Massachusetts, and lead author on the new study. "This is exciting because it may mean stars can emerge from a wider range of conditions than we once thought," he said in the statement. As a star ages, outflowing material erases traces of the early magnetic field. The original gas cloud gets partially absorbed into the star and any planets that form, and much of it also gets blown away by the solar wind. The new ALMA finding allows scientists to see what the conditions look like before that happens — and therefore reveals what the very beginnings of our solar system might have been like. ALMA measured the orientation of magnetic fields surrounding a newly forming star, realizing they're weaker and more chaotic than expected. ALMA was able to trace the magnetic field by mapping the polarized light emitted by dust grains that lined up with the magnetic field over time. "Our observations show that the importance of the magnetic field in star formation can vary widely from star to star," Hull said. "This protostar seems to have formed in a weakly magnetized environment dominated by turbulence, while previous observations show sources that clearly formed in strongly magnetized environments. Future studies will reveal how common each scenario is." The new work was detailed June 14 in the journal Astrophysical Journal Letters.